With a 3+ hour show, Frankie Says are the quickly becoming one of the country’s leading tribute acts. 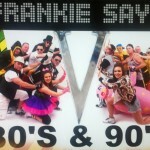 Playing all the hits from the 80’s and 90’s alongside an energetic stage and light show. Our show consists of 1.5hr 80s and 1.5hr 90s plus dj.